This is an HC-5 Elite headset. This is made by Air Rider and is designed to be used with any helmet. It has an all new high intensity helmet speaker design that combines better distortion free sound with higher volume quality. Air Rider's new system is a clamp-less headset that installs internally on all helmets (nothing attached to your helmet). It also has the smallest dynamic microphone on the market with excellent noise cancelling capabilities. 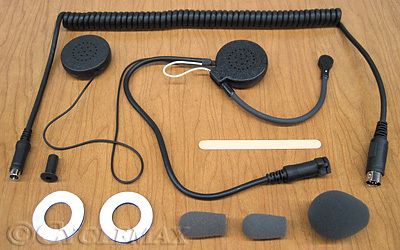 This headset comes with the coiled lower cord with the 5 pin plug that will fit all Goldwing's and F6B's from 1980-2017. This is made in the USA and comes with a 3 year warranty. Note: Air Rider will professionally install your Air Rider headset into your helmet for free. All you have to do is pay the shipping to their factory in Tennessee and they will pay the shipping back to you.